Right now I know that I for one don't have the funds to purchase a beautiful art piece for an empty wall but I probably could scrounge up some old playbills or programs to cover one. I think it would look quite charming actually. What a great idea! I am in the same boat at the moment. I am conjuring up some ideas for a very tall wall that I have. You could get even a little more permanent by adding a frame of molding form Home Depot and putting the playbills inside it. Post photos when you do it! It is definitely different, but I think that I could grow to like it quite a bit. Good work. Hope you had a wonderful weekend. I collect items like this and post them on my refrigerator, once covered I remove and start over. 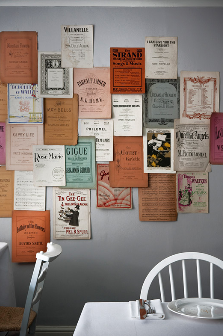 Old playbills would be a fantastic wall cover. My highschool English teacher covered the back wall with them and it was such a great conversation starter. I just tripped upon your lovely post from another blog. Good news for those that can't afford new artwork--I have 28 artists that have been giving it away for FREE incredible, incredible works. 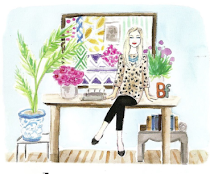 The project is called 'the bright side' we are on artist 25 BUT you still have all of last weeks artist to try to win. I promise you won't be disappointed. Oh, I do love this idea, maybe vintage sheet music.